Depending on Sept. 8 election results, the opposition in Russia could effectively be shut down. Early elections for mayor of Russia’s capital will be held on Sept. 8. This will be the opposition’s zero-hour: The key electorate for opponents of the regime is represented most widely in Moscow. If the opposition does not win on its own turf, the protest movement may be forgotten for a long time to come. Last year’s elections in the Moscow suburb of Khimki were seen by many as a dress rehearsal for the upcoming battle for Moscow. Consequently, the voting there was closely followed by all of Russia’s political observers—as was the opposition’s defeat. Yet protest leaders have been offered the chance to take their revenge far sooner than they expected: The next mayoral elections in Moscow were scheduled to take place only in 2015. The opposition’s plans have been thrown into disarray by Moscow Mayor Sergei Sobyanin’s sudden resignation. Elections for a new mayor will take place in less than three months, on Sept. 8, and many experts doubt that the opposition is ready to do battle. Both the powers that be and the opposition grew up reading the same history books, in which Moscow invariably had symbolic significance. For Russians, the critical moment in the Napoleonic Wars was the Moscow Fire, while the critical moment in World War II was the battle for Moscow. In short, victory in the capital is a guarantee of future success, just as defeat is a guarantee of failure. Even if one discounts the symbolic meaning of these elections, an awful lot is at stake. Moscow is one of two Russian cities that have the status of a separate region of the Russian Federation. But the Moscow mayor is more powerful than any of Russia’s regional governors. On Sept. 8, Russians will be electing not just the head of the city, but one of the top officials in Putin’s administration. To insert one’s own man at that level would be an epoch-making victory for the administration. At the same time, one must not forget about the economic aspect of this matter. For Russia, Moscow is a major financial, business and administrative center that sets the tone for the development of the rest of the country. Officially, the population of Moscow stands at 12 million; unofficially, it reaches 20 million. Moscow is one of the 10 largest cities in the world. In addition, Moscow boasts roughly half of all the banks registered in Russia, as well as the headquarters of many major corporations. Moscow is one of the top 10 cities in Europe deemed most attractive to investors. The city’s GDP exceeds $300 billion, which is not less than one-sixth of the national GDP. To receive control of such vast financial resources, the opposition would have to win at least 10 gubernatorial elections in key regions of Russia. Still, the chances of the protest’s ideologists winning in Moscow are far greater than they are in other regions. The protest’s electoral nucleus is concentrated in the capital. Moscow sent hundreds of thousands of people out into the streets to protest, whereas even the largest regional centers could muster no more than a couple of thousand at best. 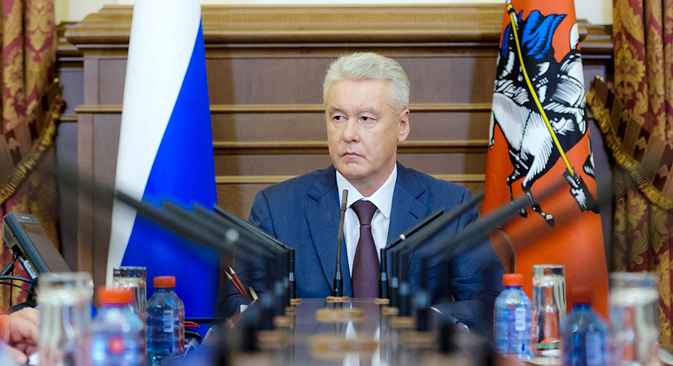 Acting Moscow Mayor Sergei Sobyanin is not only the favorite; he is, in large part, the initiator of this race. Political observers are divided in their assessments of his decision to resign early: Some were taken by complete surprise, while others were quick to say that they had seen this resignation coming. Political observer Alexei Makarkin believes Sobyanin may have other interests as well. In Makarkin’s opinion, a victory in open elections instead of an appointment from on high would allow Sobyanin to confirm his legitimacy. Sobyanin has already made public his list of priorities. A number of his initiatives, such as equipping city parks and organizing bicycle paths, have met with the public’s approval. Other plans, such as the idea of paving sidewalks in the center of the city with bricks, have been less well-received. Although the foreign press’ principal discovery of the past season was Alexei Navalny, for domestic observers, the more interesting figure is Mikhail Prokhorov — the billionaire businessman and founder of the Civic Platform party. Mikhail Prokhorov should have been Sergei Sobyanin’s main competitor. He has put together a strong team of original and independent thinkers who, most importantly, have not been sullied by the political machinations of supporters. Prokhorov should have been Sobyanin’s main competitor. However, on June 16, Prokhorov announced that he would not take part in the race. He stated that he would not likely have time to make his business conform to the requirements established for mayoral candidates, which includes transferring all of his foreign assets to Russia. “In the time allotted, I technically will not be able to transfer my assets cleanly and qualitatively,” said Prokhorov. Instead of taking part in the battle for the post of mayor, Prokhorov has decided to prepare for the City Duma elections scheduled for 2014. He emphasized that control over the legislative assembly was more important than the post of mayor. In response to Prokhorov’s accusations, United Russia claimed that, for the businessman, “foreign assets turned out to be more important than voters’ interests.” Supporters of Prokhorov called the results of the election a foregone conclusion, and all candidates—except Sobyanin—spoilers. One has to admit that many of them do indeed look like spoilers—but not the leader of the new wave opposition, Alexei Navalny. The upcoming elections in Moscow promise to be this year’s most important confrontation between the ruling power in the person of Sobyanin and the opposition as represented by Alexei Navalny. Navalny’s program has already been published: the opposition leader plans to make the state of the city’s infrastructure a priority. Sobyanin, for example, has not managed to solve the transport problem, and Navalny means to use this as his trump card. So far, not one of the rehearsals for the great battle to come has brought Navalny appreciable results. The elections in cities near Moscow and the voting in regional elections have invariably ended in victory for candidates from the ruling party, United Russia. The opposition will have to marshal all its resources in order to alter this trend and mobilize all its supporters. At the same time, Navalny will have to make his “urgent appeal” during the summer months, when the so-called creative class is on vacation far away from the capital. It is worth noting that Navalny’s chances are, in any case, greater than those of other participants in the race. A second-echelon group announced its plans to run far more efficiently than the core of the opposition. The first to announce their mayoral ambitions were three Muscovites who decided to run as self-nominated candidates. Later there came the declaration of scandalous musician Sergei Troitsky, who is better known as “Spider.” He has run for mayor twice before — in the Moscow suburbs of Zhukovsk and Khimki — but without any noticeable success. During the first week following the announcement of early mayoral elections, candidates from four opposition parties declared that they would run too. However, none of the political heavyweights have decided to participate in the race. The single exception is the veteran of the Communist party, Ivan Melnikov. As a result, most observers expect the main fight to be between Sobyanin and Navalny. The current race for Moscow mayor has the most crowded field ever. The Election Commission had received more than 30 applications by the end of June. Some political heavyweights, such as the Communist Party, have also graced the capital with their attention, but they are not fielding their charismatic leaders as candidates. Sobyanin calls them “serious challengers,” while other candidates call them spoilers who are there to divert votes from the real opposition.